Philosophical Library invites you to join us in a special celebration honoring one of history’s most acclaimed contributors to the literary world, Voltaire. Today, we are celebrating his 322nd birthday and, though he lived more than three centuries ago, his name continues to hold familiarity when it is spoken or seen in print. 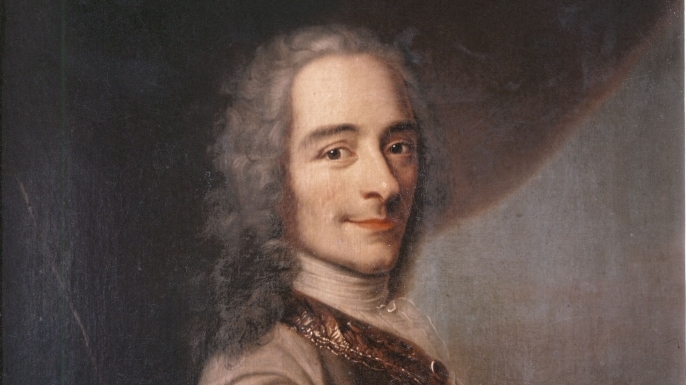 Voltaire was actually born Francois-Marie Arouet on November 21, 1694. Only later in 1718 did he assume the moniker by which he is now well-known. Voltaire was born in Paris, France and his academic career began there as well. He received an education from the College Louis-le-Grand where he eventually decided upon becoming a writer. There, he learned theology, Latin and studied strategies that would enable a speaker or writer to motivate or drive his audience. He later became a fluent speaker in the languages of Italian, Spanish and English. Though he aspired to write, his father, a lawyer, had other plans for his son and thus forced him into law school. Despite this, he continued to enhance his writing skills by composing a great deal of poetry and became quite popular among many aristocrats during that time due to his sharp wit. He took on an affair with a French Protestant refugee and was required to leave his position and return to France upon its revelation. Along with the affair, considered quite scandalous at the time, he had many run-ins with the law and was incarcerated and even exiled for a time for voicing his concern about the wrongdoings and misconduct of the government and political officials. He wasn’t afraid to speak out against religious intolerance, any unconstitutional barring of civil rights and the prevention of allowing people freedom of thought. Along with poetry and plays, Voltaire wrote novels, essays, and historical, political and scientific texts as well, spanning his works over a wide variety of genres. His writings are still read, researched and enjoyed today, including his work The Philosophy of History. This reprint of the original 1776 edition shares Voltaire’s philosophy about life, reality and his interpretation of the moral, esthetic and religious views and customs of ancient civilizations that have shaped history. Writing with courage and conviction, the author focuses on invalidating the established notions that influenced contemporary issues. This piece is a valuable read for anyone studying Voltaire or the Enlightenment – a period of time for which he is considered to be a reigning thinker and contributor. For more details and to purchase this title, please click here.